First, I begin with much thanks and praise for your prayers. We are on the mend. My head is still weary and wants to hang down, but I could not rest until I began to share the journey of the past four days. Last Thursday, Meredith and I were invited to Joanne’s home for lunch and some crafts. So I looked forward to the visit, the new-found friendships, and the craft-time to finish some things I began. So Meredith (pictured to the left with Joanne’s pumpkin that she grew in her own backyard!) and I found some child care and headed north to Joanne’s home. We drove very near the home, when I realized I forgot the exact road. So I called and Joanne’s husband Toben answered. I smiled when he said turn on the street where the tree is turning colors for fall. What a great beginning! We drove up and were greeted in the driveway with a hug from Joanne, and we walked into a storybook tale. Oh yes, we did! Our visit was so full of laughter (some bent over laughter, too! which I love!) and stories and enjoyment of one another. In the background, worship music that made my knees weak played. We got to meet Toben and see and hear some of their interaction, which I always love to see–people who love and understand one another deeply in marriage. So much joy! We came to the table overlooking Joanne’s beautiful decorated-by-God-for-autumn backyard. I wanted to stay right there and put up my tent. It was a wonderful and restful retreat. 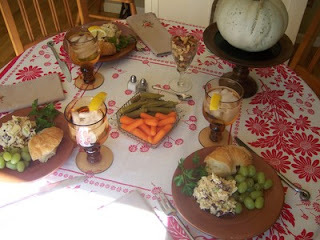 Joanne had created a royal lunch for us of chicken salad and croissants. She quoted Anne of Green Gables’ friend Diana Berry in saying how nice it would be to be rich and eat chicken salad and live in fine houses. To which Anne replied that we are rich for we have our friendship and imagination. So we feasted on richness and fatness at Joanne’s. It was such a high and wonderful time. We shared wonderful and scrumptious food–and best of all, we shared ourselves and our stories. It cannot get any better than that my friends! As if the day could not be any more of a gift, Joanne gifted us with a beautiful basket of goodies…& books. I had already bought and read Joanne’s book Living Simply (You must get it and read it. It will give you much inspiration and add such richness to your life, too! ), so Joanne shared that with Meredith. Then I received a book called True-Faced, which I believe is such a powerful book in being who you are with others. It’s a book about freedom in your life and relationships. Who doesn’t need that? It is a must read for those of you who long to be freed up to do what God is dreaming for you to do! May I say that besides all that I have written, the very best part of the day was the love and care for detail that Joanne put into the day? She planned for us and prepared and thought about us…which made the time all the more special. Meredith and I came away as blessed and deeply loved friends with Joanne. I tell you my heart is still so full from that feeling of being made special…just like Jesus does….just like He would do. Indeed Joanne is a well-balanced Mary and Martha! She prepares and serves, and yet knows the importance of sitting at the feet of Jesus. So we shall do this again. And I encourage you to find some friends to invite over and plan for…to treat and pamper…to spend time doing something together beyond what you normally do. If you cannot think of someone to invite, do what Joanne did and invite people you don’t know very well. For a stranger may be just the one to bring into your life and add richness and friendship! I think that looks a lot like Jesus, too! Then he said to his servants, “The wedding banquet is ready, but those I invited did not deserve to come. Go to the street corners and invite to the banquet anyone you find.” So the servants went out into the streets and gathered all the people they could find, both good and bad, and the wedding hall was filled with guests. Be sure that when you are invited to the wedding that you are dressed appropriately (Matthew 22:1-14). How is that, you ask? Clothe yourself in Christ. He ALONE is enough. Come dressed and ready! For this is a story-book tale that is real. And someday, we shall see Him and know Him, even as we are fully seen and known. Tomorrow, I will tell about Friday, when I flew to Dallas/ Ft. Worth for a Texas-sized offer from Bev. You, dear Holly, are too, too kind. It just boils down to the fact that I love you and am thankful to have you for my friend! And, you have no idea how much you and Meredith blessed me last week. It was entirely my pleasure. And I suppose that the bottom line really is the fact that God has lavished love on us and it just spills over on to others. He is so good! wow – i can’t wait to read more!!!!!!! Holly, you did such a lovely job re-creating the day! It was a blessed day indeed! Well blogger seems to be up and running again. So now I will once again leave a comment. I am so glad you had a female day with your girls. I miss getting together with my girls. And I love doing little things that make them feel special. Good food and good friends–nothing like it! what a beautiful gesture of genuine hospitality from joanne…it all sounded so intriguing, so inviting…y’all reminded me of I Peter 4:8-11 above all love deeply cause it covers over our multitude of sins and offer hospitality using the gifts you have been given, faithfully giving God’s grace, speaking the very words of God. OH how wonderful! It looks like a beautiful day!! Sounds like y’all had a fabulous time. Love the book True-Faced…I think I read it about 3 times, then passed it on and didn’t get it back…I’m sure it’s a blessing to whomever’s hands it landed in. Your posts really are such fun to read. I just ordered the book. Can’t wait to read it!